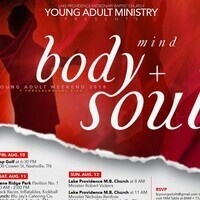 Join the young Adult Ministry for the 2018 Young Adult Weekend, August 10-12!!! We have fun events planned for everyone to enjoy! Sunday, August 12 @ 8:00am and 11:00am, we will close out the weekend with worship as the LOVE United Choir renders the music and two of our Young Adult ministers preach the word!